A herringbone pattern is made up of small rectangles arranged so they fancifully resemble the bones of a fish. When laid, these small black handmade encaustic cement tiles form an attractive broken zig-zag design and the slight variations in the colour add extra charm. Sixty -six of these tiny encaustic tiles make up one square meter, and the depth of their colour layer means that they will never fade. A herringbone pattern is made up of small rectangles arranged so they fancifully resemble the bones of a fish. When laid, these small grey handmade encaustic cement tiles form an attractive broken zig-zag design and the slight variations in the colour add extra charm. Sixty -six of these tiny encaustic tiles make up one square meter, and the depth of their colour layer means that they will never fade. A herringbone pattern is made up of small rectangles arranged so they fancifully resemble the bones of a fish. 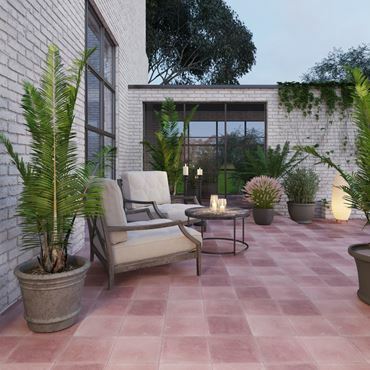 When laid, these small rich pink handmade encaustic cement tiles form an attractive broken zig-zag design and the slight variations in the colour add extra charm. Sixty -six of these tiny encaustic tiles make up one square meter, and the depth of their colour layer means that they will never fade. A herringbone pattern is made up of small rectangles arranged so they fancifully resemble the bones of a fish. When laid, these small warm brown handmade encaustic cement tiles form an attractive broken zig-zag design and the slight variations in the colour add extra charm. Sixty -six of these tiny encaustic tiles make up one square meter, and the depth of their colour layer means that they will never fade.